Long ago, in October 2009, I rushed eggs up to my neighbor Sheri's incubator. I thought I would let 2 of my "girls" sit on eggs until they hatched. One Thursday night I went out to the coop and saw a sweet little, fluffy chick. Warm maternal instincts flooded through me and I could hardly wait to go out the next morning to see how many more chicks had hatched through the night. The next morning I lifted up the hen to check on the baby chick and any new baby brothers or sisters that may have emerged and ...didn't find a one. It took me that long to look up into the mother's face...only to see a barely hatched chick dead and sticking out of her beak. Not only was that one dead, the little chick from the night before was nowhere to be seen. Gulp. I pulled the remaining eggs out from under the cold-hearted and cruel/non-instinctive mother hen and took them to the incubator. 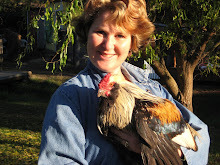 Sheri watched over them for me and when the babies were born, we brought them up in a box with a heat lamp. Only 3 of the chicks made it. Out of all of those chicks, only 1 was a pure-breed Ameraucana. The three were pals as is the case with any chicks that are raised together. High school friends of mine came to visit and named the purebreed, Mary. I tagged the two other ones #102 and #103 with foot bands, the first time I have ever done that. As my luck would have it, the other two chicks grew up into strapping young-buck ROOSTERS!!! DANG! Right now they are sitting in our dog, Tasso's, crate on their way to Western Farm where I will happily sell them. After a long and hectic week I relaxed in the back yard by letting the chickens out of the pen to run around and munch on the grass. I watched as both #102 AND #103 had their way with the same hen and then Dad/Ivanhoe would join in. It was a too much for me. So...today is the trip downtown! For some inexplicable reason my pictures aren't posting right now. I will share images when I am able. You never know who you are going to bump into when you travel. We had to go all the way to THE SOUTH to run into and meet Thomas Keller of the French Laundry. I was just as excited to meet Frank Stitt of the Highlands Inn of Birmingham. This meet up took place in the lobby of our hotel, Aloft, in Birmingham, Alabama when we were there for our book promo tour. Farmer Jeff and I have been on the road a lot this month traveling down to Mexico to where we have been consulting with their chef and today we returned from a trip to both Birmingham, Alabama and Atlanta, Georgia. Y'all know how much we enjoy "The South" and this trip just sealed the deal. I PROMISE to post pictures, give some details and catch everyone up on the chicks...both batches! These videos were taken last night on Day 18. All in preparation of the birth/hatching of the chicks! Thanks to the folks who originally took this photo. I copied it after seeing it on someone else's site. We are getting very excited around here! The babies are due to start hatching on Thursday, day 21. On Monday or Tuesday we will have to move the eggs off of the egg turning device in the incubator. This is to prevent the little chicks legs from getting caught! I had to look up a picture on the internet to let me know what the Silver Hamburg chicks look like. I am especially excited about these chicks because their breed is on the American Livestock Breeds Conservancy list in the "watch" category. Farmer Jeff spent part of the day building the first of two brood boxes. He is amazing! The both of us keep forgetting just how many babies we are going to have once the hatch takes place...I need to buy special medicated chick feed for them! I also mentioned that I would need to get a bigger chick feeder for them because I don't think our little regular feeders would handle it all. We shall see!